V-Strom adventure motorcycle range. The newcomer joins the standard DL650A V-Strom and its more powerful DL-1000 V-Strom stablemate, and epitomises the spirit of adventure inherent to the V-Strom badge. The new DL-650XT features a distinctive ‘beak’ front-end design – a styling approach inspired by the Suzuki DR-Z that participated in the 1988 Paris-Dakar event, while unique spoked aluminium wheels shod with tubeless tyres underscore the newcomer’s adventure touring focus. The upper section of the XT’s bodywork is painted in a range of attractive colours, while the lower parts and the sides of the body are finished in contrasting black. A textured surface underscores the newcomer’s rugged status. Underpinning the XT is the same light and rigid twin-spar aluminium frame and swing arm that’s already a tried and trusted feature of the V-Strom range. The frame is focussed on providing a confidence-inspiring balance between stable handling and agile responses, while the long-stroke front and rear suspension soaks up bumps and dips with ease. An upright riding position makes for long-distance comfort, augmented by the three-way adjustable windscreen. Wind tunnel testing ensured that the compact bodywork and the windscreen deliver both rider protection and low noise levels, thus reducing rider fatigue on extended journeys. The Suzuki DL-650XT is powered by a 645 cc four-stroke DOHC engine. The 90-degree V-twin’s key characteristics include good low-down torque for powerful response at low to medium engine revs, a broad powerband for excellent tractability under all conditions, and superb fuel efficiency, thanks to a low-friction design and optimised combustion. “With the continued growth in demand for versatile motorcycles that are as adept at urban commuting as they are tackling the great outdoors, the new DL-650XT V-Strom provides aspiring buyers with an appealing, comfortable and versatile adventure motorcycle option,” says Stuart Baker, sales manager of Suzuki Motorcycles. 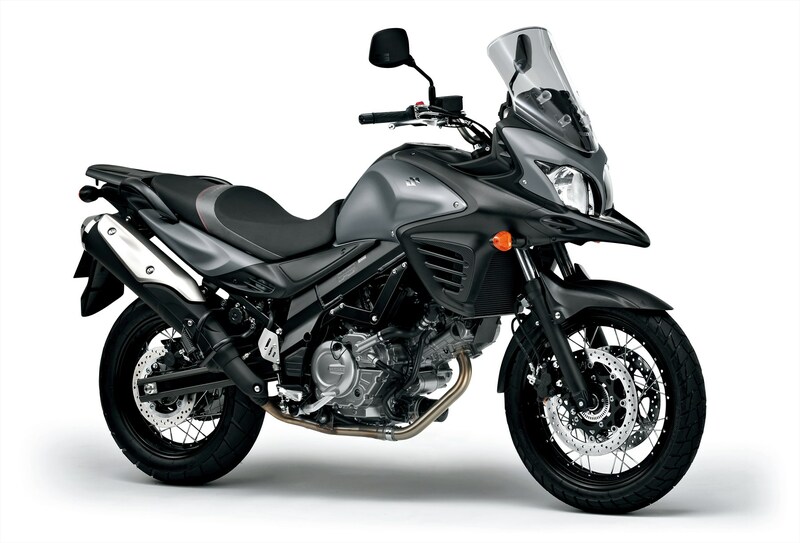 “The 650XT’s focus on adventure touring hasn’t compromised its abilities as a daily commuter – an aspect that is becoming increasingly important as motorists turn to motorcycles as a way to cope with traffic congestion. At the same time, its excellent fuel economy also adds low running costs to its list of attributes, making the XT a particularly attractive all-rounder,” he concluded. Suzuki’s designers followed a theme of ‘tough, smart and wild’ when they developed the styling of the new DL-650XT. It expresses the functionality required of adventure tourers, but also takes aerodynamics, agile handling, ride comfort and visual appeal into account. The result is a motorcycle that looks aggressive but wieldy, with balanced proportions and compact dimensions. Combining painted upper surfaces with tough and rugged black, textured finishes for the lower surfaces, the design confirms the XT’s versatility, while augmenting its aesthetic appeal. A design highlight is the new beak-shaped front cowl, a feature inspired by the Suzuki DR-Z campaigned by French rider Gaston Rahier in the 1988 Paris-Dakar rally raid. 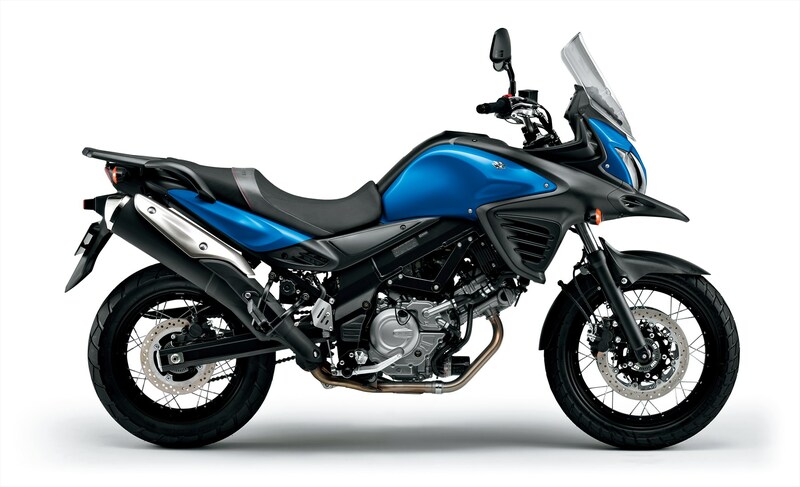 Rahier’s DR-Z was the first to feature a beak-like front end – a Suzuki original design feature which has since become a popular design feature in the adventure bike segment. The new beak cowl is smoothly integrated with the 650XT’s front bodywork, and features intake ducts that channel air to the radiator. The XT’s bodywork is slim, compact and functional, ensuring long-distance riding comfort and overall ease of use. Dual halogen headlights are horizontally arranged and operate simultaneously in both dipped and high-beam mode. Extensive wind tunnel testing has resulted in a windscreen that benefits rider comfort by reducing wind noise and buffeting. The three-way adjustable screen has a revised rake angle to reduce turbulence, and can be raised by 24 mm or lowered by 18 mm from the centre position. This allows the windscreen position to be fine-tuned to suit most riders as far as size, riding position and operating conditions are concerned. The seat is long enough to suit most rider preferences, and is mounted low to make it easier for riders to reach the ground. The pillion section is sculpted to prevent the pillion rider from sliding forward and provides good hip support for extended riding comfort. A multifunction instrument cluster features a bright, easy to read LCD display offering a broad range of information. The various readouts can be scrolled through via a conveniently located selector on the left switch box that allows operation without releasing the handlebar. Included are a speedometer, odometer and trip meter, as well as a gear position indicator, fuel gauge, fuel economy indicator, coolant temperature gauge, digital clock, and an ambient temperature display. The display brightness can be adjusted in six steps. The DL-650XT employs the same rigid but lightweight twin-spar aluminium frame and swing arm as the standard model. Lighter but stronger than conventional steel designs, the aluminium frame features superior rigidity, creating a perfect platform for the XT’s smooth-running V-twin engine, and delivering both stability and manoeuvrability. The 598 mm swing arm links an extruded arm and pivot to a cast joint section and provides 59 mm of rear travel. The lightweight wheels (19-inch front, 17-inch rear) combine aluminium rims with wired spokes, which allows for reduced unsprung mass and greater shock absorption at low riding speeds in the interests of ride comfort and handling. The wheels are specifically designed for use with tubeless tyres, which deflate more gently in the case of a puncture. The front and rear tyre sizes are 110/80R19M/C 59H and 150/70R17M/C 69H respectively. The front suspension employs forks with a 150 mm stroke, and feature five-step preload adjustment. At the rear, spring preload can be conveniently adjusted without tools by turning an adjustment knob located under the right-hand side frame cover. This allows quick and easy adjustment for different riding and load conditions. The DL-650XT is equipped with electrically controlled digital ABS anti-lock brakes to ensure stable and confident braking, regardless of road surface. The new DL-650XT is powered by a 645 cc DOHC four-stroke V-twin engine designed for broad torque delivery at low to medium engine speeds. The 90-degree V-twin’s distinctive beat is an unmistakable aspect of the XT’s overall character. While low-down torque and midrange tractability are particular highlights, the V-twin also revs eagerly, with sustained power delivery across an extended power band to match. Engine operation is smooth and linear, ensuring ample urge, regardless of riding conditions. Technical highlights include a compact combustion chamber with large-diameter valves set at a narrow angle, and shot-peened con rods. The engine employs Suzuki’s Dual Throttle Valve (SDTV) fuel-injection system and twin iridium spark plugs per cylinder. The engine cylinders are plated with Suzuki’s Composite Electrochemical Material (SCEM), which boosts torque at low engine revs, and ensures smooth engine speed progression across the entire rev range. The Suzuki DL-650XT V-Strom is available immediately from all authorised Suzuki SA motorcycle dealers nationwide at a recommended retail price of R94 950.